sewing happens here. sometimes other stuff… but mostly sewing. Man, I feel like this blazer took me an eternity to make! There’s that point in blazer and coat-making where you feel like you’ll never finish and you just can’t bear to complete one. more. step. It’s been a while since I’ve made any tailored outerwear, so I was a little rusty in terms of construction order. In the past I had followed the RTW jacket sew-a-long on Pattern~Scissors~Cloth but I thought I would do more hand-sewing this time around (this comes to play once you start attaching the lining). In the end, I ended up going back to the machine and scrapping most of my hand sewing plans. Since I’ve already detailed my fitting and construction in previous posts (here and here) I won’t rehash all that. In short—I found the fit to be very good, so long as you go down one size from the size chart. The “size down” thing is pretty standard (unfortunately) with Big 4 patterns, so always make sure you check the finished garment measurements first. About the only thing left to talk about is the lining. I picked up a poly charmeuse from joanns, mostly because I was really excited about having a print instead of a solid color. I love the print, but I don’t think I’ll be using this type of fabric for a lining again. It was extremely difficult to sew, it frayed like MAD, and it does end up feeling a little plastic-y. However—PAISLEY! So that basically makes it all good in my book. The shell fabric (wool) has a good weight to it, so this will be a blazer to wear when it’s cold. The poly lining actually lends extra warmth, for better or worse. I do prefer the feel of a rayon bemberg lining, but the stuff I can typically find around here is too thin for blazer or coat lining. As I already mentioned, I decided to ignore most of the pattern’s directions and instead followed the construction order of the RTW Jacket sew-a-long. I did the sleeve shell/lining join, and started the hem bagging by machine. It is so much cleaner to finish the facing/lining/hem join by machine rather than trying to hand stitch all that. What I did was sew the facing hem all the way to the dart seam by machine. Then from there, I catch-stitched the remaining hem turn up, and then fell stitched the lining in place. I do think that this gives a nice crisp hem line, superior to simply tacking the hem facing at the SA’s. Plus, that small bit of hand sewing doesn’t take that much extra time. Random note: I typically need to lengthen sleeves by 1″ on patterns, but I didn’t make any changes here. So, if you suffer from an average to short arm length… you may need to alter the sleeves. I did feel like I had a hard time getting a good crisp press at the lapel and collar edge. Part of this is due to my failing iron (the water chamber leaks, so I have to use a spray bottle with water to get any steam) and the thickness of the wool. In the end, I decided to topstitch the collar and lapel to get the crisp edge I needed. I’m completely happy with this decision given that I wanted a casual look and I had already topstitched the patch pockets in place. The extra topstitching at the collar fits right in and ends up being a nice detail. All in all, I am very pleased with the fit I achieved, the fabric is killer, and I know I’ll be wearing this a lot. I can already imagine sewing up both the short and long length options in a variety of fabrics. 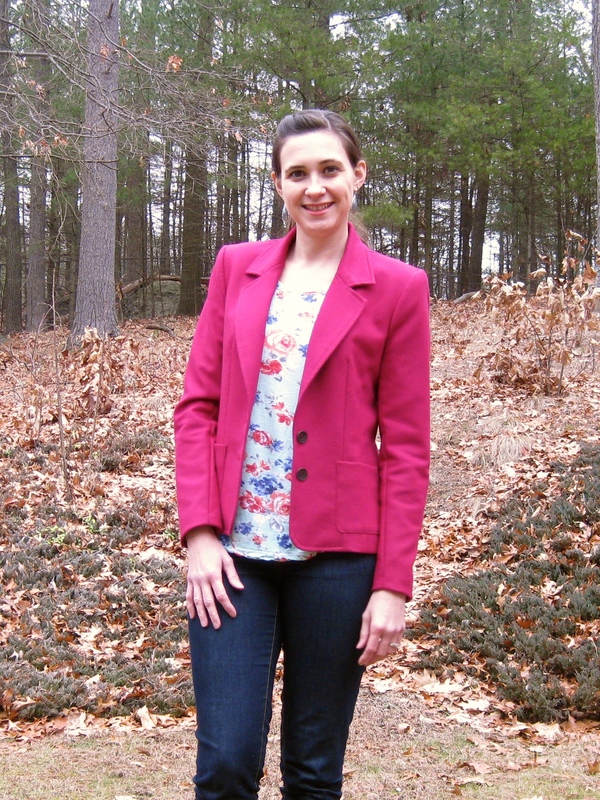 Basically this pattern is very versatile, and if you’re looking for a classic blazer pattern—this is a good one. Sheesh… now that’s it’s winter here, maybe I should start a winter coat. Ya know, so I can wear it sometime by March. Life has been pretty hectic around these parts… unfortunately my sewing time, not to mention blogging time, has been virtually non-existent. So, so sad… I actually had decent Halloween costumes made up for the kiddos this year, but I never got around to getting good photos, so… oh well. They’re up on IG if you’re interested. Instead of trying to post all the unblogged things, I’ll just jump ahead to what I’m working on now. Namely, a blazer! I’ve been wanting to make a blazer for a long time, so I jumped in when Gail and Shar teamed up on IG and were all like “Yeah! We’re sewing blazers! Wooooooo!” Andrea joined up as well, and we were all pretty gung-ho for a couple of days. So… that was the end of Septemeber, and we aimed to be done by the end of October-ish. Oh what, it’s mid-November now? Heh heh… oops. I muslined the blazer (what seems like) ages ago but only this week did I transfer my alterations to my pattern and got cutting. I’m going for a relaxed fit, so I tried to keep my fitting low key. I stuck to my usual changes and did a 1″ SBA, a 1/4″ FSA (I didn’t mess with the sleeve cap, I figure it will be easier to just make some small adjustments when I set the sleeves), and took a small tuck out of the lapel. The only thing left troubling me was some restriction in arm movement. In the past I’ve shortened the depth of the armhole to gain more movement, but when i fiddled with the seam line on my muslin it left the back of the armhole looking kinda funny. Then by chance, I read Idle Fancy’s post with a ton of fitting links, including this one from A Fashionable Stitch. BINGO. That’s exactly what I needed. I don’t have broad shoulders, but I think perhaps my forward shoulder makes the standard armhole placement a little off? Or maybe it’s something else altogether… who knows! The change was fairly straightforward. I simply straightened out the curve on the back of the jacket, and added a little extra in the same part on the sleeve. Things got a little dicey when I was altering the sleeve since this has a two-piece sleeve and the adjustment crossed between the two pattern pieces, but I think I’m in a good place. Basting will be my friend when I get to the sleeves. I feel the need to apologize for the terribly lit iPhone photos… it’s a dark and dreary day! The fabric I’m using is a very nice Pendelton wool that was gifted to me by one of my husband’s aunts. A few months ago she sent me a box of five cuts of wool (with receipt dated from 1992!) and the pink is just the right shade of bold without being obnoxious. Now that my fabric is cut, I need to get to fusing. The fabric has nice weight to it, so I’m using a weft fusible, reinforced with a little hair canvas fusible on the back collar, front lapel, and upper chest. I’m pretty excited to get going now that my schedule has eased a bit and I have some momentum behind me. Who knows, I may finish it by the end of November… only a month late! perfect corners on waistbands? yes you can!